The first shipment of concentrate from the new Thompson Concentrate Load-Out Facility (TCLO) was loaded onto truck June 24, 2018. Construction and commissioning of the TCLO are complete and the new facility is now officially part of Mill operations. 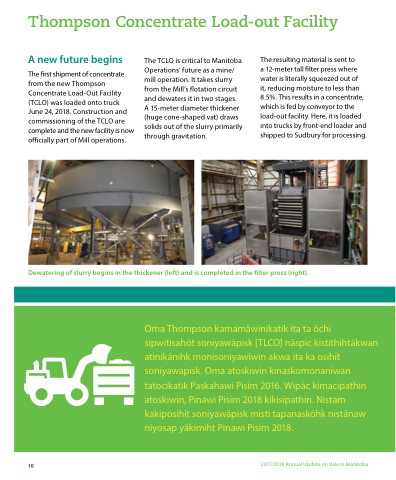 The TCLO is critical to Manitoba Operations’ future as a mine/ mill operation. It takes slurry from the Mill’s flotation circuit and dewaters it in two stages. A 15-meter diameter thickener (huge cone-shaped vat) draws solids out of the slurry primarily through gravitation. it, reducing moisture to less than 8.5%. This results in a concentrate, which is fed by conveyor to the load-out facility. Here, it is loaded into trucks by front-end loader and shipped to Sudbury for processing. Dewatering of slurry begins in the thickener (left) and is completed in the filter press (right). Oma Thompson kamamāwinikatik ita ta ōchi sipwitisahōt soniyawāpisk \[TLCO\] nāspic kistithihtākwan atinikānihk monisoniyawīwin akwa ita ka osihīt soniyawapisk. Oma atoskiwin kinaskomonaniwan tatocikatik Paskahawi Pisim 2016. Wipāc kimacipathin atoskiwin, Pinawi Pisim 2018 kikisipathin. Nistam kakiposihīt soniyawāpisk misti tapanaskōhk nistānaw nīyosap yākimiht Pinawi Pisim 2018.